Owner.. John Dewar & sons. Capacity.. 3 500 000 litres. Scotland’s iconic DEWAR’S® Aberfeldy Distillery Visitor Centre in Aberfeldy celebrates DEWAR’S portfolio and provides visitors with a more in-depth and engaging experience, showcasing historic memoirs, some of which have never been seen before. In-keeping with DEWAR’S rich heritage, visitors to its spiritual Highland home, located just three miles from the birth place of John Dewar, will be welcomed with a brand new visitor experience. 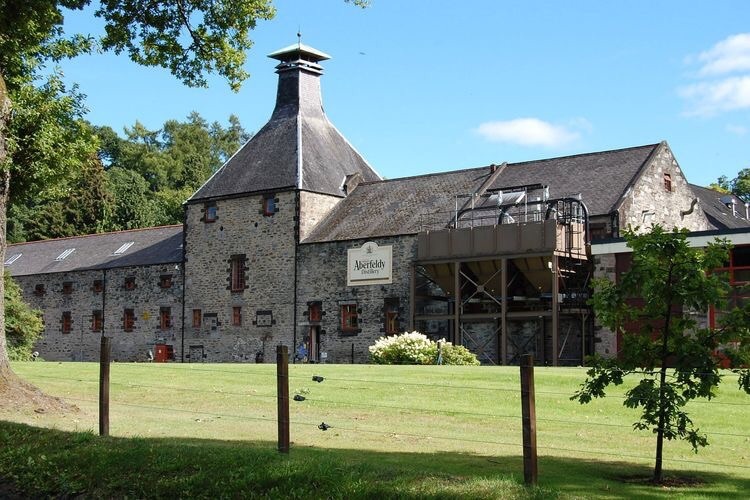 This world-renowned crafted Highland Single Malt has been produced at the Aberfeldy Distillery since 1898 and the visitor centre is located in one of the original buildings. The refurbishment has been undertaken with the utmost care, retaining many of the traditional features of this historical building. A stunning and dramatic ‘stave tunnel’ installation, made from oak casks, leads visitors from the heritage centre to the hosting area and a new hand-crafted glass light feature has been created with hand-blown glass droplets fashioned on whisky droplets. To complement the existing heritage exhibition, there is also the feature archive wall, which showcases vintage memorabilia, signs and advertising campaigns from throughout DEWAR’S history.